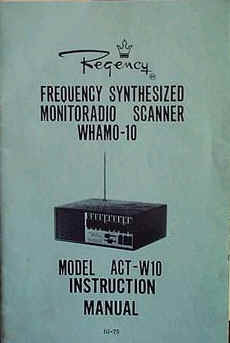 Instruction Manual and a Frequency Comb Programming Directory for the vintage Regency model ACT-W10 "Whamo" scanning radio receiver. The manual measures approx. 5 ½ X 8 ½" and consists of 20 pages. The directory measures approx. 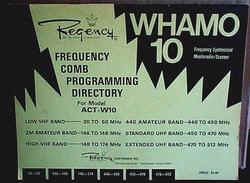 8 ½ x 11"
We have had several requests for these manuals or copies of them. We are unclear at this point as to if we have the manuals themselves or someone provided these pictures just for this section. We do not sell the artifacts that are part of the core collection. Since there has been more than one request for these someone can help fund a scanning project on them and the information will be placed here online for all to use. Also in the time passing... if someone finds a manual of this or scans already online let us know so we can either host a copy of it here or provide links to it.